On Windows, you can do most things without ever opening a Command Prompt or PowerShell window. However, from time to time, you have to run Command Prompt to get the job done. Things like installing FFmpeg, download HLS videos, to split MP3 files, etc., need you to use Command Prompt. Though most things you can most thing with regular Command Prompt, sometimes you need elevated Command Prompt. i.e, Command Prompt with admin rights. Now, one of the most common ways to open Command Prompt as admin is to search for CMD in the start menu, right-click on it and select the option "Run as Administrator." If you are good with Windows keyboard shortcuts, you can use Ctrl + Shift + Enter. This is good enough for the most part. However, if you are finding yourself opening the Command Prompt as admin frequently then wouldn't it be awesome if you can remove the additional step and always open Command Prompt as admin directly. Let me show you how to open Command Prompt as admin every single time on Windows 10. The below method works on Windows 7 and 8 too. The easiest way to open Command Prompt as admin every single time to is to the give the start menu's Command Prompt shortcut admin rights. It is easier than you think. Just follow the below steps. 1. Open File Explorer with the keyboard shortcut Win + E. In the File Explorer, go to C:\Users\<username>\AppData\Roaming\Microsoft\Windows\Start Menu\Programs\System Tools. Don't forget to replace <username> with your actual username. Note: Windows 7 users should go to C:\Users\YourUserName\AppData\Roaming\Microsoft\Windows\Start Menu\Programs\Accessories. Again, replace <username> with the actual username. 2. Here, find the Command Prompt shortcut, right-click on it and select "Properties." 3. In the properties window, click on the "Advanced" button. 4. The above action will open the "Advanced Properties" window. Select "Run as Administrator" checkbox and click on the "Ok" button to save changes. 5. Click "Apply" and "Ok" buttons on the main Windows too. 6. That's about it. From now on, whenever you try to open Command Prompt from the start menu, it will open with admin rights. Of course, you need to click "Yes" in the UAC (User Access Control) prompt. 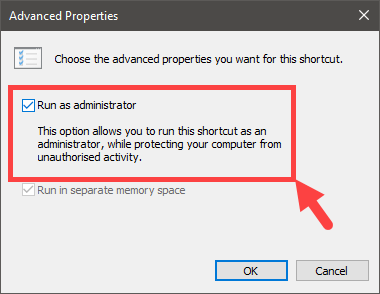 With the above method, you no longer have to right-click and select "Run as Administrator" to open Command Prompt as admin on Windows. Just search for CMD and press enter to open Command Prompt with admin previlages. 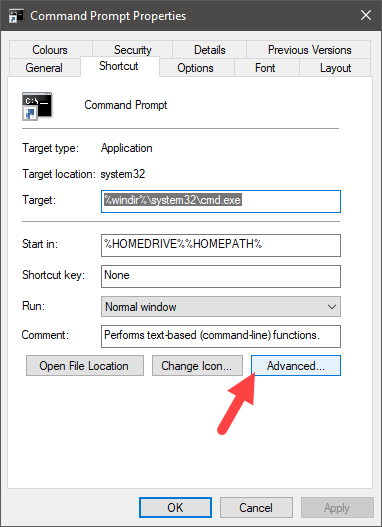 If you like this Windows tip, you might also like learn how to open Settings app on Windows 10 from Command Prompt and how to schedule shutdown and cancel shutdown from Command Prompt. Hope that helps. Comment below sharing your thoughts and experiences about using the above method to always open Command Prompt as admin on Windows 10.